When choosing a stain for your outdoor furniture – garden furniture or patio furniture. There are several factors to consider with choosing the kind of stain that is best suited for your rustic decor. The two main stain bases are either oil-based stain or water-based stain and there are certain situations where one is better to use than the other. Oil and water-based stains provide different levels of protection and coverage depending on factors such as the type of wood, previous wood treatment, weather exposure and more. Below, we’ve provided some context for your important decision of using oil-based stains versus water-based stains. Did you know that eco wood doesn’t stain as easy as regular wood and it’s better for the environment too! Click here for more information. When choosing a stain to apply to your wood, it is important to first identify the correct stain base. In the debate between oil-based stains vs. water-based stains, if you are coating a wood that has a natural resistance to rotting, a water-based stain is the better option. Some examples of this kind of wood are cedar and redwood. The kind of weather the outdoor wood will be exposed to also plays a factor in determining the best stain-base for your project. If the wood is going to be in direct exposure to wind, rain, and sunlight, an oil-based stain is the best choice. This is because it is more durable than a water-base and will provide a more complete protective layer against these elements. ADDITIONAL PROTECTION can be achieved on items with water-based stained by adding a SPAR URETHANE as a top coat. While we’re talking about outside furniture, make sure you invest in a decent cleaning device such as those found here https://www.bissell.com/vacuums/handheld-vacuums to help you keep on top of maintaining it. If you are interested in custom rustic decor and rustic furniture, take a look at the items that we have for sale. We use the best stains to ensure that your purchase is protected. 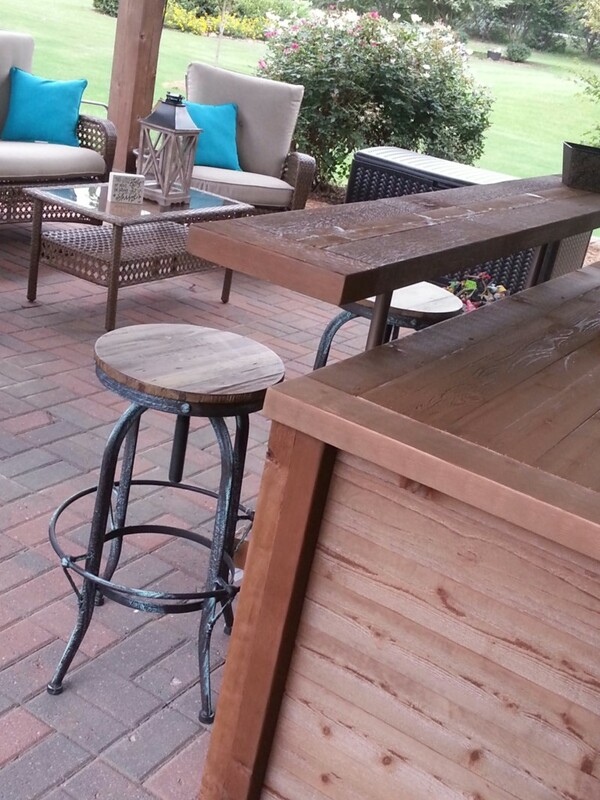 The items that we offer include home bars, bar cabinets, rustic furniture, garden furniture, patio furniture, indoor furniture, outdoor furniture and more. Contact us today for more information.